Ever since its inception, the brand has become a must-have amongst athletes and sports enthusiasts alike. The brand has left an unmistakable mark on all the tennis enthusiasts of the world with the amazing Dunlop racquet gear. Sun & Sand Sports brings to you a brand that is known best for its remarkable designs of racquets and accessories. The Sun & Sand Sports selection of Dunlop racquets is perfect to meet all the individual athletic needs of everyone from an amateur to a pro. Browse the Sun & Sand Sports collection of Dunlop racquets online today. Since it’s inception in 1909, Dunlop has strived to make its name in the world of tennis. Today, some of the best players in the world swing their Dunlops with pride. 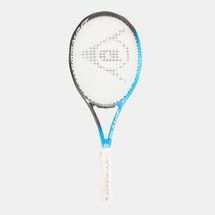 Hass, Robredo and Mauresmo all use the Dunlop M-FiL 300 racquet, which is well enabled to attacking all court and baseline play. 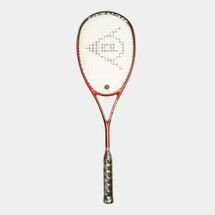 This racquet offers a balanced blend of maneuverability and stability, and the stringbed provides plenty of feel whether you are a player who likes to charge the net, or if you prefer to stay back. 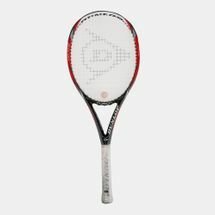 If you are looking for a racquet that can help improve your game, you need look no further than the Dunlop 900G series. Boasting a large sweetspot and innovative Dunlop tennis racquet technology, the 900G measures in at 25.5 inches, increasing your reach and your power. In addition, the HotMelt process used to manufacture the 900G series gives you an edge over players using a traditional graphite racquet. HotMelt provides a molten graphite skin over the racquet's entire frame, increasing power by 30 percent as compared to other brands. Loaded with innovation, the 900G series also boasts Concave Frame Technology. This technology increases the legendary sweetspot by featuring an increased depth of cross section in the top half of the racquet. Dunlop's latest foray into cutting-edge engineering resulted in the Aerogel line of racquets, currently favored by Greg Rusedski. Dunlop Aerogel claims to be the world's lightest solid material yet it has strength of up to 4,000 times its own weight. The Aerogel series takes advantage of this nano-technology to deliver a phenomenal strength-to-weight ratio. This refined ratio results in increased power and enhanced stiffness to deliver the perfect control-to-power ratio for all players. Buy Dunlop sports equipment and other accessories from the Sun & Sand Sports online store and have your products delivered to your doorstep in Kuwait City and elsewhere in Kuwait.